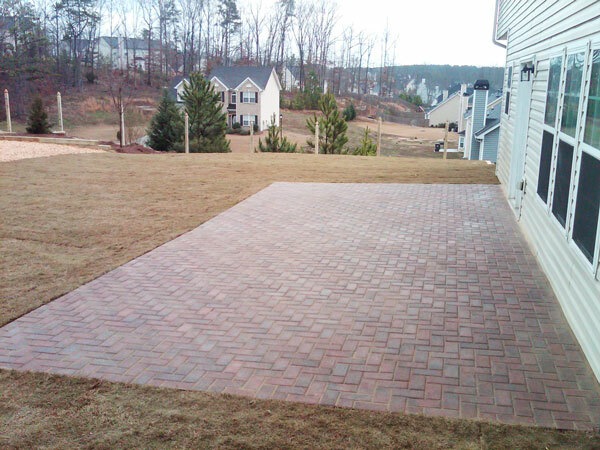 Stoeckig Landscape Group has been providing landscaping services for more than 30 years in Dacula, GA and surrounding areas. We have developed a reputation for providing personalized service to every client. From hardscape and landscape design to installation of the ideas, we strive towards 100% customers’ satisfaction. Some of our clients have sent their words of appreciation about our work. 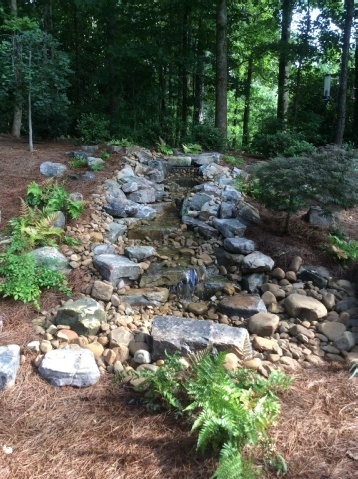 Curt completed a full landscape renovation on our half acre lot. 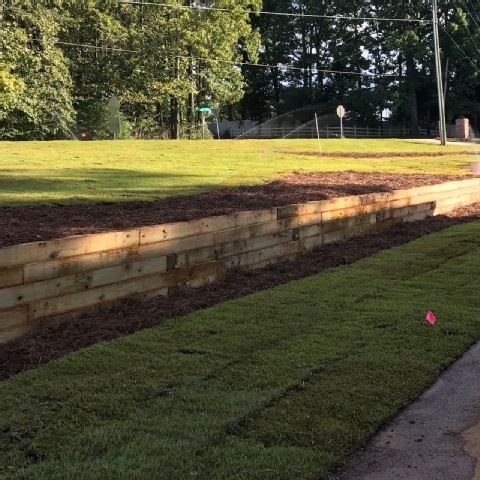 Included drainage, sloping, hardscape stepping stones, retaining wall, and pebble path, planting beds, irrigation and installation of zoysia sod. He was on site daily, responsive to all communication, and very professional. We've done a major renovation on our entire home, and he has been our best contractor! Highly recommend. My experience with Stoeckig Landscape Group was terrific. They were very efficient and dependable while working on my yard. Great results and very reasonable price. These guys wrote the book on professionalism. They created a design that was perfect to suit my needs and installed it with ease! They even finished the job two days before the promised date. I would highly recommend them to anyone!! Update February 2008: My landscaping has done great. We enjoy every minute of our patio and look forward to another great Spring. From start to finish, they were very professional. Quick Responses to my calls/concerns. Workers were polite and courteous. Great job! Curt has done work for us many times over the years. We are always happy and keep bringing him back to assist us with more projects. His crew is always polite, and the results are amazing. It never fails, we always have neighbors that stop by to see what he has done. In addition, my next door neighbors were so impressed that he has now designed and installed both of their yards. Stoeckig Landscape Group truly does great work. I have witnessed it first hand on several occasions, and I can also testify to the long term success of their projects. Satisfaction at its best. From the time we 1st inquired to the end result - we are 100% satisfied. Curt was very responsive on our initial call. He came out very promptly on our appoint time. He offered his professional advice and gave us several scenarios based on our budget. His crew was very friendly, came on time and left the job site very clean each day. The crew was very professional and worked the entire time they were here. Curt was very responsive to all communications - email/phone call. Professional work done at the appointed time and the cost was very reasonable. I would recommend this landscape company to any of my family or friends. Stoeckig Landscape Group created a landscape plan that was perfect for my yard. The guys Install walls,trees,plants and a new lawn for my kids. We even have plans to Install a pond later this year.If you want a company that will go the extra mile call Stoeckig Landscape Group. I am working on several projects in my home and only had a couple thousand budgeted for my landscaping. Curt came out and gave me some great suggestions. 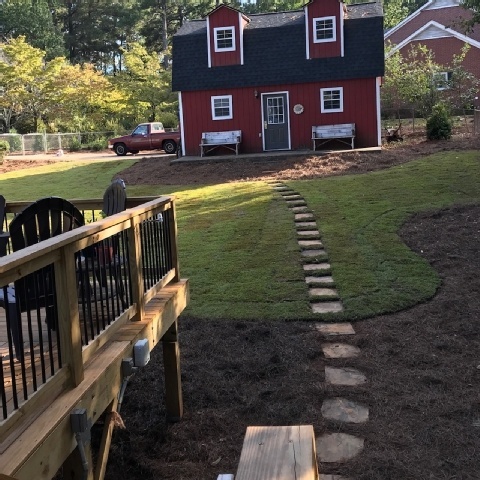 We transplanted several things to other areas of the yard, planted some new trees, flowers, some grass in bare areas and added fresh pine straw and now my yard is something I can really be proud of! When I have more to spend, I am going to have him come back and redo my patio. We did a major patio expansion Roth new wall and put in a waterfall. End result exceeded our expectations and is beautiful. They are easy to work with and very professional. The owner was right here supervising the work! Highly recommend. On time, in budget and quality work. After a consultation/estimate from another landscaper, I decided to use Stoeckig Landscape Group because I liked his suggestions & price better. They replaced 5 diseased euonymous at foundation with variegated pittosporum, junipers with creeping gardenias & an arborvitae with fragrant tea olive. Also, mulched shaded side yard with cyrpress & pine straw, aerated, overseeded & fertilized fescue lawn. Work was scheduled within 2 weeks, started & completed on schedule & neatly. He even replaced a broken sprinkler head at no additional charge. The plants are still alive after 2 weeks & fescue seed is sprouting. I liked Curt's suggested plantings and he was very responsive to my many questions and concerns about the choices in a shaded area. UPDATE January 2008...everything is still living and thriving. I am still very pleased with the plant choices and execution of the plan by Curt. Affordable, friendly and beautiful plants! Stoeckig Landscape Group was easy to work with. They spent more time with my husband and I going over different types of looks for our yard than the other landscape companies we called. They answer any questions that we had and the Install went great. Will certainly use again! Stoeckig Landscape Group designed my entire installation on the new home I built. Curt took into consideration everything we wanted and brought tons of great ideas to the table. We had the installation executed exactly as the plan was drawn and it is gorgeous! To begin, this company was the only one (of three) who arrived on time for my initial interview. Design ideas were creative; great at problem solving/offering solutions to some of our trouble spots. Design was well done and took into account many of my preferences while also ensuring plant heartiness and variety. I felt the overall design was VERY practical (which was good). Owner was great with communication - always informed me of progress and/or changes that needed to be made. Owner and crew were always on time and were very efficient with installation, and owner was on-site during installation. The project consisted of removing existing landscape, reshaping or forming new beds, relocating certain trees/shrubs, planting new flowers, shrubs, and trees, and installing sunken flagstone walkway. Additionally, irrigation system was installed. Curt came out not only once but twice to discuss with me landscape ideas for a 4' drop in the corner of our yard. He had come up with a plan that worked within my budget, with plants selected based on a variety of factors, all in a way that appealed to me. I was impressed with the design, and had them come out to perform the install. They arrived quite early in the day (before 8am) and worked very quickly with a large team (including Curt) installing our new design. Curt spent extra time talking with me about how to care for each of the new plants, how and when to prune, and even talking about general landscaping and lawncare questions I had. He made sure that I was satisfied with the work, and all in all we were happy with the outcome and love the design. Stoeckig Landscape Group redesigned my back yard and it is Great! Our landscape designer came up with some real good Ideas that were so much better than the other landscape designers. The crews work hard and a week later my back yard is ready to handle the summer parties. The hardscaping is wonderful. Rick spent a lot of time going over all of our plants and trees with us you could see he loves what he does. If you are thinking about investing in your back yard paradise this is the company you need to call. Great work guys! Curt and his team did a fantastic job on our backyard. Curt was very responsive and accommodating in the planning stages of our yard work, even meeting with us after normal business hours to accommodate our hectic work schedules. Curt and his team were very professional and did a thorough job down to the clean up. I would highly recommend Stoeckig Landscape Group. I will most definitely use them again! 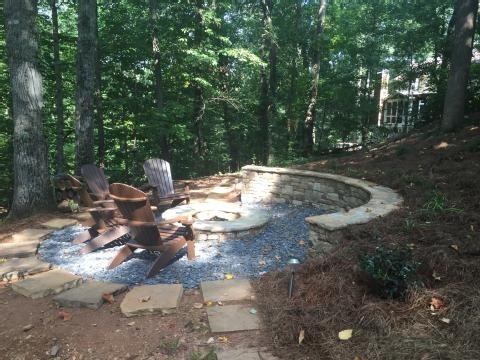 Stoeckig Landscape Group installed a brand new stack stone wall and patio in my backyard. It looks great and blends well with the landscaping. I am looking forward to many cookouts! We have plans to use Stoeckig Landscape Group again this fall for more projects. In 2006, a friend of mine had Stoeckig Landscape Group install their landscape. They were very pleased, so I had Curt draw a design for my yard. My initial plan was to install it myself over time, but this year I decided to go ahead and have Stoeckig Landscape Group finish it up. They came out exactly when they promised and completed my yard. We also decided to add a Stack Stone Wall. I was a little hesitant about the wall at first because I had another one on my property that was old and crumbling. But the Stoeckig Landscape Group Team took the existing wall down and replaced it with a beautiful one that will last forever. I am very pleased and will most certainly use them again. Fantastic Customer Service is a rare find these days, but you'll find it in them. Stoeckig Landscape Group installed a wall and patio in our backyard. We had to jump through a few hoops with our HOA, but Curt remained very patient and never made us feel rushed. He worked with us and our budget, he presented multiple stones to us to make decisions regarding our walls, making multiple trips to our property to answer questions prior to installation. He recommended websites to get ideas about plants in our next phase and was careful to help us consider plants that would match how much time we had to spend maintaining it. In short, it is apparent that he and his dad, Rick, love what they do. This isn't just another job to them, it is their profession, and it shows in their finished product. Great job guys!!! I would recommend you to anyone. Got a great landscape plan I can install myself at my own pace for a great price. Highly recommend. Hired Stoeckig Landscape Group to do some drainage work at my house. Showed promptly, did the work as described, great experience! Great landscape design drawn by Stoeckig Landscape Group. They were very thorough and spent a great deal of time with my wife and myself. Great value for the money. Highly recommend. Great quality, great price, great job! Was first company to show up on time (actually a few minutes early) for initial meeting. Had great ideas, implemented them well within promised time period. Very friendly and helpful office staff. Definitely recommend! After meeting with four landscape companies, I went with Stoeckig Landscape Group because I was impressed with their ideas and they were quite personable. I wanted to develop great curb appeal for our new home, so we started by adding color and walls in our front yard. Later in the spring, we will use them again for a patio and fire pit in the back yard. We also referred them to our neighbor who is planning to have them landscape their yard in the next few weeks. We moved into a house that had overgrown plants in the front yard. We had Stoeckig Landscape Group replace them with new ones. The difference in the way the house looks from the street is unbelievable. We will use again for more extensive work in the spring. Needed to have previous landscaping removed and recommendations of what would be easy to care for/low maintenance. Was very impressed with Curt's abilities to provide vision and very prompt customer care response. Showed up on time for quote/installation and follow-up. Highly recommended!!! Stoeckig Landscape Group installed a beautiful patio for us. They wanted to make sure we were happy with the layout and then installed beautiful plants surrounding the patio. We love the way it turned out. We had a couple of plants not make it, and Curt was right out within a couple of days to replace them. Will certainly use again for future projects! Curt and his crew met all of our expectations and responded with creativity and professionalism as we needed it. They turned our already quiet backyard into a serenely, peaceful and beautiful garden. The design was what we asked for and the plantings are healthy, growing and the color keeps changing as different things bloom. We installed rainbarrels and with the educational review and instructions that we received from Curt, along with the smart plant choices he made, we're confident that we can care for and water within drought condition guidelines. You really should call even if just for a design that you do yourself. They know what their doing. Curt drew a design that we can install ourselves over time. He met with us on multiple occasions determining our likes, dislikes, and how we were planning to use the space. This was not a "cookie cutter" design. His care, patience, and creativity gave us a design that has our personality through and through. Highly recommend. We hired this company to build a wall in our backyard as well as a stone walkway in the front. They did a great job! Definitely recommend! We had Stoeckig Landscape Group draw a plan for our yard in early summer and just finished the first phase of it, which was a wall. We are very happy with the results and look forward to completing the rest of the plan. Very prompt and professional. Reasonable price for excellent work. Had two walls built in 3 days. We put our house on the market in the Spring and used Stoeckig Landscape Group to give our home great curb appeal. We got our investment back quickly, as the house sold much sooner than we thought. Once we moved into our new home, we used them again to design our front and back yards and are having them install it in phases. We started with an irrigation system, sod, and plants. Phase two (which they are completing now) is a stone patio. Phase three (this winter) will include an outdoor fireplace. We are very excited about our new yard!! Fantastic Customer Service. I can't say enough. Returned my original call promptly...drew a great design. Prompt, professional installation. Not pushy, answer all questions thoroughly. Very patient, incredibly knowledgeable. Treat you like you are family. Everything you want as a customer. Will recommend again and again. We hired Stoeckig Landscape Group to design and install landscaping in our new home. We purchased a home in a "cluster" type neighborhood and had a small area to work with, but still wanted our landscaping to be spectacular. We went with Stoeckig Landscape Group because we liked Curt's ideas the best. He was never pushy with us as we tried to make decisions regarding the landscaping. He installed it in a reasonable amount of time. We couldn't be happier. Curt just finished landscaping my backyard and it looks great. He did my front yard this past spring and I was just as happy then. Everything looks great and is easy to maintain. After putting in a walkway, I noticed one of the stones had a crack in it. I called Curt and he came out himself to replace it within just a couple of days. Office staff is friendly and communicates messages well. The "right hand" definitely knows what the "left hand" is doing. Just had a brick patio put in. Very nice guys and quality work. Highly recommend and will use again! I wanted a design that I could install myself over time. Before our first meeting, Curt sent me a "wish list" to get me thinking about what I wanted planted. He listened to me, used my wife's favorite colors, and added great features for the kids. He brought us examples of his work so we knew exactly what we'd be getting. The design was affordable, and we now have the perfect design and plan in place. My wife and I can't wait to get started on installing it ourselves. Showed up on time for appointment, scheduled work within two weeks, said project would take 2 days and completed within specified time frame. Quality work. Highly recommend. We enjoyed working with these guys. They showed up on time for initial appointment, went over all our options, and were very professional. Were incredibly patient with my husband (when he changed his mind about a plant selection for the third time.) Would recommend to anyone. I've used this company on three occasions to design plant beds and put in new plants, etc...for me. They always do a great job. This spring, they are going to plant a "Pizza Garden" for my kids; planting peppers, tomatoes, etc...for them to make their own pizzas. They are so excited! Re-did my plant beds with all new plants and beautiful flowers. Really nice, honest guys. Most certainly recommend. When I hired Stoeckig Landscape Group I wanted to redo my front lawn. I didn't know what I wanted in the front, all I knew was that the existing plants (which looked terrible) must not be part of the equation. I explained this to Curt, and he drafted up a great looking plan for the yard in minutes. He walked through what plants would go where, when they would bloom, etc. I felt like the job was started at nearly the same time I gave him the go ahead - and the yard was finished within a day. Overall - the service was professional, timely, and the finished product looks great. If you want to enhance the look and value of your property rely on Stoeckig Landscape Group. 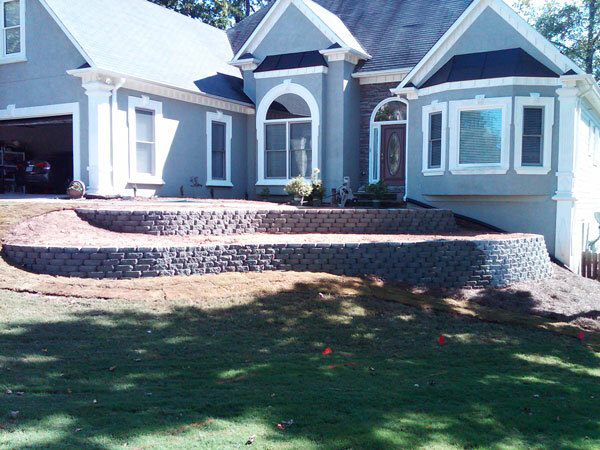 We are the landscaping and hardscaping experts in Dacula, GA. Contact us for hardscaping ideas for your property.